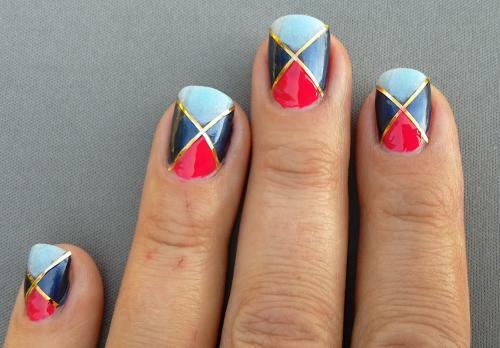 Striping tape can provide a pop and a shine to any manicure. The tape comes in a variety of colors and finishes, and it can help you create nail art that is guaranteed to get noticed. Whether you're interested in making basic stripes or a more elaborate design, striping tape is easy to use to create a one-of-a-kind manicure. It's not too complicated to apply striping tape. The process is the same as using stickers or decals. Regardless of the design, the basic steps and the supplies for using striping tape are the same. Start by applying a clear base coat and two coats of color nail polish. Use a quick drying manicure spray to speed drying time. Decide where you want the design to start and end before placing the striping tape. If your design is more in the center of the nail than edge to edge, you will want to make sure that the polish is dry before starting the tape placement. Otherwise, you may smudge or ruin the polish when pressing down the tape. Roll out the tape across your nail, lightly pressing as you go. If you're doing your own nails, leave enough tape on the starting side to stick to the side of your finger as an anchor. Cut the tape using nail scissors where you want the tape to end. Once all the tape has been placed, make sure all ends are clipped. 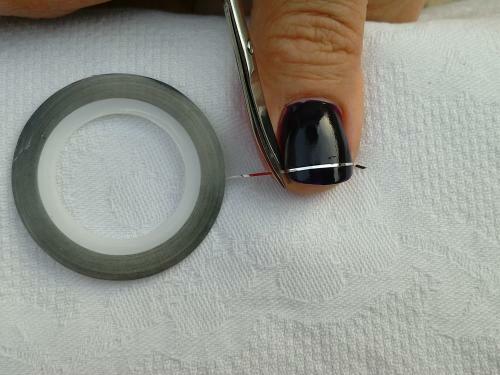 Using your finger or a wooden cuticle stick, press down on the ends to secure them. On the tip, clip the tape so that it just meets the edge of the nail. Apply a clear top coat to ensure that your design is sealed. These ideas will get you started with striping tape. Experiment with different color combinations and shapes. The design shown above is an easy, basic nail art project, which is perfect for beginners. It looks great in purple and silver, but you can use any colors you like. Start with two coats of a dark purple base color, such as OPI Viking in a Vinter Vonderland. 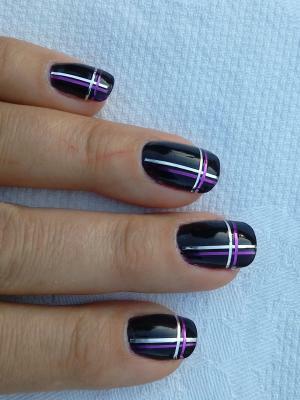 Use silver striping tape and purple striping tape. Make one stripe of each going down the nail. Add one each across the nail toward the tip. While this design can be done with any color as the base, the black polish makes the design really pop. Start with two coats of a deep black polish, such as OPI Black Onyx. 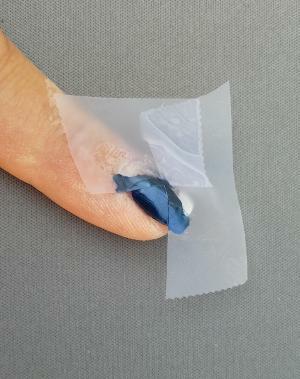 To make a clean dividing line, place a piece of Scotch tape over the dry black polish. Use a multi-color glitter polish to paint the lower part of the nail. Cover the division line with light blue striping tape. Color blocked nails are fun and eye-catching, and there are lots of ways to create this type of nail art. You can choose any layout for the blocks, including diagonal lines of tape for triangles or straight lines for squares, rectangles or stripes. For this design, you will want to stay within the same color family or use complementary colors. The design shown here is done with two shades of blue, an orange coral, and gold striping tape. Begin by placing scotch tape for your first block area. This becomes the stencil for the other triangles as well. Use a denim blue polish for this triangle of exposed nail. Allow the polish to dry. Repeat this on the opposite side of the nail. Now you have the layout for the rest of your design. If you have a steady hand, you can fill in the other two triangles freehand. Otherwise, wait for the polish to dry completely and simply move the tape stencil so that the denim nail polish is covered and the lines stay clean. When the last color is dry, apply the gold striping tape and top coat. Apply two coats of your favorite hot pink nail polish. Use a silver chrome polish for the tips. This may take two coats, depending on how well it covers. 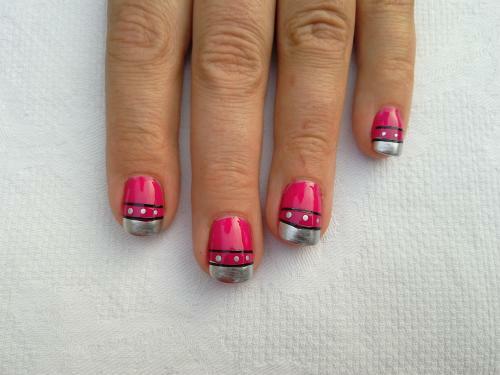 Apply black striping tape to the smile line (where the pink and silver polish meet). 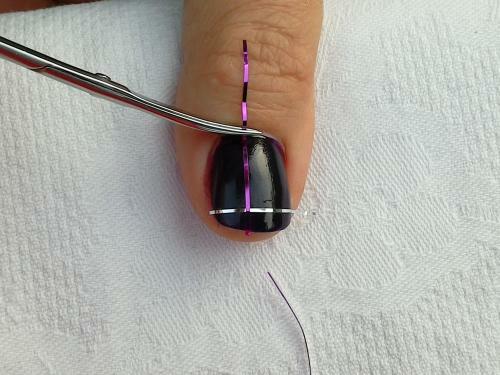 Apply a second stripe about midway up the nail in the pink. 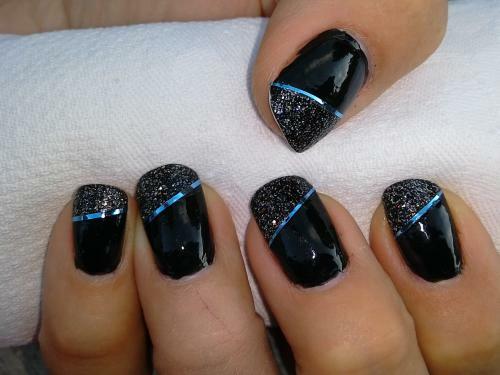 Use a dotting tool or toothpick with the silver polish to make three dots between the lines of black striping tape. Women of all ages, especially young girls, love a little extra sparkle. Striping tape gives that sparkle even if it is a simple strip of gold or silver across the smile line of a French manicure. As with all nail art, you can use striping tape to unleash your imagination and creativity.